is the distance from the column face to the edge of the column head is the diameter of a circular column. 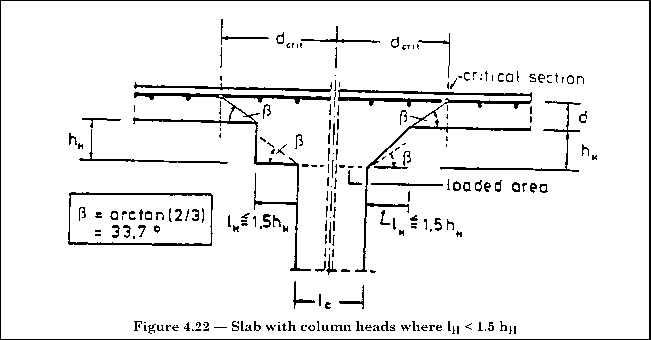 (2) For slabs with column heads where 1h > 1.5(d + hH (see Figure 4.23), the critical sections both within the head and in the slab should be checked. (3) The provisions of 4.3.4.3 apply for checks within the column head with d taken as d^ (see Figure 4.23 for definition of d^). where rRd is given in Table 4.8, Section 4.3.2.
dx and dy are the effective depths of the slab at the points of intersection between the design failure surface and the longitudinal reinforcement, in the x and y directions respectively. Npd = prestressing force corresponding to the initial value without losses (equivalent to Pmo in 2.5.4 and 4.2.3). If the prestressing force is different in the prestressing directions, the average value is used. 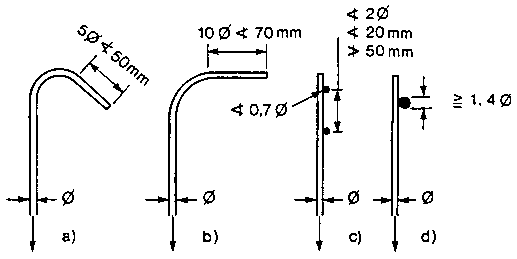 Npd should be calculated with Yp = 0.9.
where C Asw fyd sina is the sum of the components of the design forces in the shear reinforcement in the direction of the applied force, a being the angle between the reinforcement and the plane of the slab. For other types of shear reinforcement (e.g. shearheads), vM3 may be determined by test or taken from appropriate documents. (2) Shear reinforcement should be provided within the critical area. (3) Where necessary the punching shear resistance outside the shear reinforced area should be checked by considering further critical perimeters. 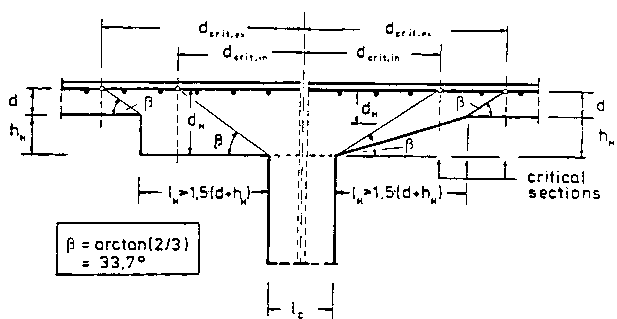 How to calculate concrete column head? 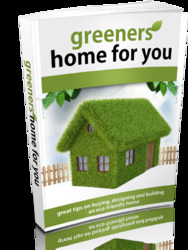 How to calculate shear reinforcement in piles to eurocode 2? What is column head in structure? What is column head in structural design?